In a transformer it is observed that, all the flux linked with primary winding does not get linked with secondary winding. 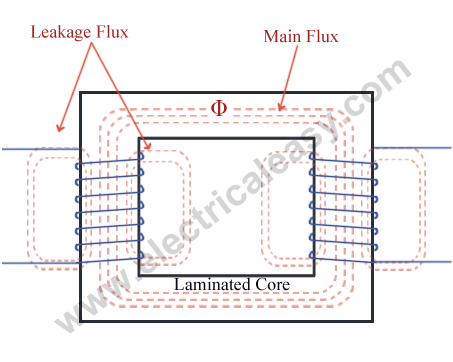 A small part of the flux completes its path through air rather than through the core (as shown in the fig at right), and this small part of flux is called as leakage flux or magnetic leakage in transformers. This leakage flux does not link with both the windings, and hence it does not contribute to transfer of energy from primary winding to secondary winding. But, it produces self induced emf in each winding. Hence, leakage flux produces an effect equivalent to an inductive coil in series with each winding. And due to this there will be leakage reactance. In the following figure, leakage reactance and resitance of the primary winding as well as secondary winding are taken out, representing a practical transformer. X1 and X2 = leakage reactance of primary and secondary winding resp. Z1 and Z2 = Primary impedance and secondary impedance resp. Z1 = R1 + jX1 ...and Z2 = R2 + jX 2 .